Managing Users in the Syncfusion Dashboard Cloud. 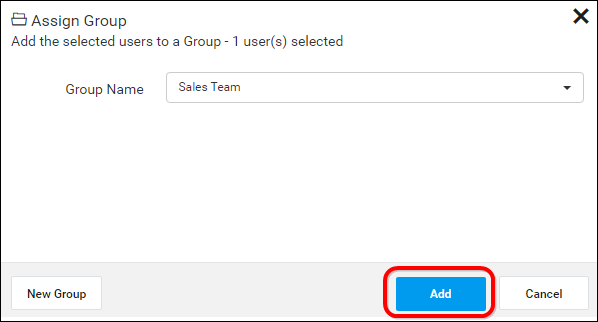 This section explains on how to add, edit, activate, deactivate, delete users and also on how to manage the permissions and assign users to groups in the Syncfusion Dashboard Cloud. Users can only be added/edited/deleted by the users, belonging to the System Administrator group. 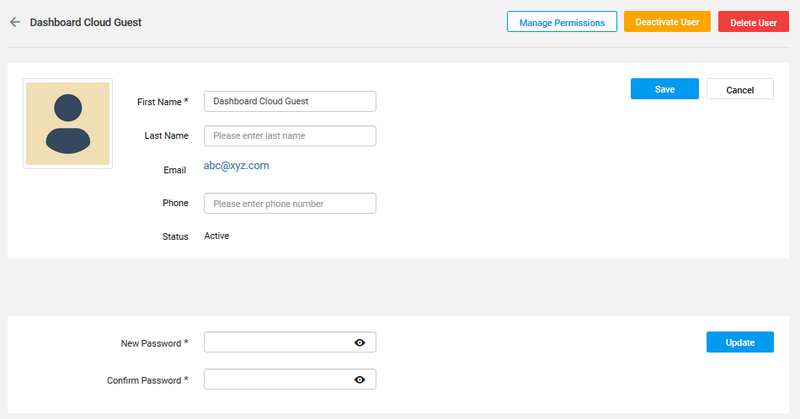 To add new users to the dashboard cloud, click on New User and then Create User from the User Management page. The Add User dialog will be shown as like in the image below. Fill the form with Email address, First name and Last name and click on Add. New account will be created for the user and an account activation email will be sent to the email address with activation link to activate the Dashboard Cloud account. The activation link sent to the user will be valid only for 2 days and if the user have not activated within the 2 days, a new activation link can be sent to the user from the user edit page. Check Activate Users section for more details. The account will be in inactive status till the user activates the account from the activation email. To automate the process of adding large number of users to a Syncfusion Dashboard Cloud, you can download the CSV template file and add the users in it and then import the file. You can navigate to user management page by click User Management drop down under the Admin menu as below. The section will explain on how to import the users from CSV file which can be downloaded from below location in Dashboard Cloud application. In Dashboard Cloud, click Import from csv. The first row in the CSV template represents the column heading. Syncfusion Dashboard Cloud assumes that the data from the second line in the file represents the user. We have the following columns are considered as mandatory in the downloaded CSV file. 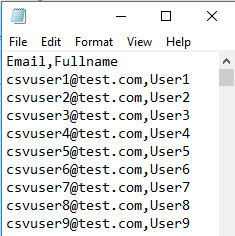 Add users in the CSV file. Save the CSV file and upload it. Once the file is uploaded the user details will be shown in the grid as like in the below image. After uploaded the users in Dashboard Cloud the results are displayed as below. User profile details can be edited from the users edit page as shown in the below image. First Name, Last Name, Phone number and the login password for the user can be edited by the user belonging to the ‘System Administrator’ group. Users can be deleted from the Dashboard Cloud when the user no longer requires the access. Users can be deleted from the user management page or from the edit page. Users can be deactivated at any time. Once deactivated, the user cannot log into the Dashboard Cloud. To deactivate a user, select inactive from the status dropdown in the user edit page. 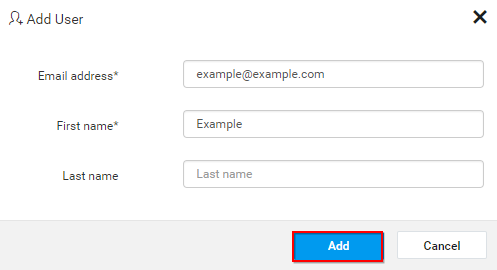 Inactive users can be activated by clicking on the Resend Activation Code button in the user edit page. This will send an account activation email to the user with an activation link to activate the account and again this activation link will be valid only for 2 days. If the user has not received the activation email within 2 days or missed to activate the account, the System Administrator has to resend the activation email to the user. Check the Manage Permissions section to learn how to manage permissions to an user. Users can be assigned to one or many groups from the user management page. 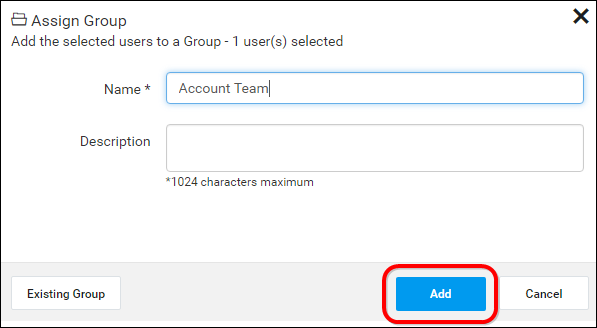 Users can be assigned to an existing group. A new group can also be created at this time and the selected users can be assigned to the new group. All the users in the group will have the permissions of assigned group.